The Federal Ministry of Health has banned the production and importation of codeine as active pharmaceutical ingredient for cough preparations to check substance abuse among Nigerians. The Minister of Health, Prof. Isaac Adewole, made the decision known in a statement issued by Mr Olajide Oshundun, Assistant Director of Information in the ministry, in Abuja on Tuesday. The ban came as Aisha Buhari, wife of the president expressed concern about the addiction rate to the drug, especially in northern Nigeria. On her Instagram page, she asked for action from the authorities. Aisha said on her Instagram account that her NGO, Future Assured has also recently launched a campaign against substance abuse. “Simultaneously, the wives of Northern Governors are working tirelessly on the issue. They have recently renovated and commissioned a rehab centre in Kogi and Kebbi state, while similar efforts are ongoing in other states”. Her intervention may have spurred government intervention, especially as it coincided with revelations that a pharmaceutical company in Lagos sold 60 bottles of the syrup to an undercover reporter in one fell swoop. The company, Emzor Pharmaceuticals has sacked the sales executive, while it said it has also shut down the production of the codeine based cough syrup. In the statement issued today, the minister of health directed the National Agency for Food and Drug Administration and Control (NAFDAC) to ban the issuance of permits for the importation of codeine as active pharmaceutical ingredient for cough preparations. Dextromethorphan is a cough suppressant used to treat coughing, it is also a drug of the morphinan class with sedative, dissociative, and stimulant properties. “ These agencies shall work together to increase pharmacovigilance around codeine, tramadol and other related substances of abuse,’’ Adewole said. The minister said Civil Society Organisations would be strengthened to deliver effective sensitisation, prevention, treatment and rehabilitation services. He renewed the commitment of government to ensure the full implementation of the National Drug Distribution Guideline (NDDG) by Jan. 01, 2019. 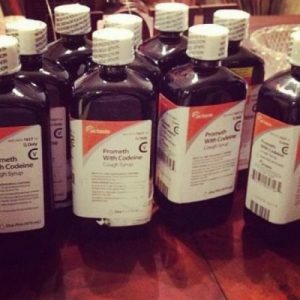 It is estimated that as many as three million bottles of codeine syrup are drunk every single day in just two states, Kano and Jigawa.